If you are wondering what to do in Siem Reap, then wonder no more, as this historical town has a variety of Siem Reap attractions, which all add to the charm and allure of this beautiful tourist destination. From famous temples to jungle adventures and an upbeat nightlife, there are so many essential experiences for every traveler, no matter if you stay 1 day in Siem Reap or 2 days in Siem Reap. The temples are on everyone’s list of things to do in Siem Reap, and Angkor Wat doesn’t disappoint. Considered as one of the largest religious monuments in the world, Angkor Wat was the centre of the Khmer empire that once ruled most of Southeast Asia. Although the civilization went extinct, the breathtaking temples and ancient buildings still remain, and are a must visit during every Siem Reap travel, and can also be explored in 1 day in Siem Reap. One of the biggest establishments in the Angkor temple complex is Preah Khan, which should be a part of the things to do in Siem Reap. More than just a significant temple, Preah Khan was a large Buddhist university filled with over one thousand teachers. It should be on your what to do in Siem Reap list during your Siem Reap travel, as the site remains mostly unrestored with many trees growing around the ruins. Historians also believe that a well-known battle was fought on site, as the temple was a palace for Yasovarman II and Tribhuvanadityavarman as well. On the way between Angkor Wat and Angkor Thom, you will come across a tower that was created by Harshavarman I, an Angkorian King who wanted to honor his father. This is one of the many ruins which must be on your list of things to do in Siem Reap for both its architecture and interesting history. Other Siem Reap travel attractions include temples such as The Bayon, which stands in the centre of Angkor Thom and has 54 towers and 216 faces of Avalokiteshvara, an earthly manifestation of the self-born eternal Buddha Amitabha. This site is recommended in the list of things to do in Siem Reap for every historical fanatic, and is best visited during sunrise or sunset during your Siem Reap travel. If you are still eager to visit other beautiful temples during your 1 day in Siem Reap or 2 days in Siem Reap, you should definitely check out Ta Prohm, which didn’t change since its discovery. Surrounded by a thick jungle, Ta Prohm lets you envision exactly how the temple appeared when it was discovered in the 19th century. Try avoiding the crowds by arriving early, rather than mid-day to enjoy this wonderful site during your Siem Reap travel. It is one of the top Siem Reap attractions that must be on everyone’s what to do in Siem Reap list! Another temple that is among Siem Reap attractions include Banteay Srei, which is situated about 12 miles north of Angkor. The name of this Siem Reap travel destination translates to “Citadel of the Women,” and refers to the decoration’s size and delicacy. Unlike other popular temples, this was not a royal shrine, and so it should be included in your list of things to do in Siem Reap, as it offers a different take compared to the other temples on the list of Siem Reap attractions. Other things to do in Siem Reap, whether you are spending 1 day in Siem Reap or 2 days in Siem Reap, include a 1000-foot elephant terrace which was once a giant viewing stand at royal and public ceremonies. This enormous path, part of Siem Reap attractions, is strikingly adorned with many lion figures. It is rumoured to be one of the busiest destinations, surrounded by camera-loving tourists, so it is recommended to arrive early or late to avoid overwhelming crowds. During your Siem Reap travel, more fascinating things to do in Siem Reap include a visit to Srah Srang, usually referred to as “The Royal Baths.” This tourist attraction was once a main bathing place for every living thing besides elephants. Today, local children enjoy the area for swimming. 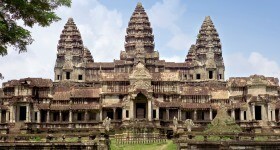 It is certainly a destination that should be on your what to do in Siem Reap itinerary. In addition to your things to do in Siem Reap, the Terrace of the Leper King is also worth a visit. Constructed in the 13th century, this seven-layer terrace was named after the god of the underworld, whose naked figurine stands at the top. Visitors at this Siem Reap attraction should keep a look out for secret passageways that run from the structure’s southwest to northwest side. Last but not least, tourists should find time during their what to do in Siem Reap quest to visit the Pub Street, which is Cambodia’s party hub. You should begin your night at Asana, while working your way down the road to find a restaurant for dinner. All establishments offer affordable Western and local flavours. You are sure to find lots of things to do in Siem Reap here!